Select Artifact Distribution Chart (Single Tracker) from Distribution Reports. Select a tracker from the SELECT TRACKER(S) drop-down list. Select one or more planning folders (select the check boxes) from the SELECT PLANNING FOLDER(S) drop-down list. Select one of the options from the DISTRIBUTE BY drop-down list. Select one of the options from the OPEN VS CLOSE drop-down list. 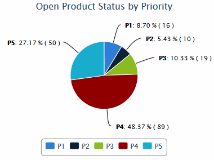 Leave the CHART DISPLAY TYPE as Pie, which is the only available chart type for this report.